This article is about the oasis in the city of Al-Ain in the Emirate of Abu Dhabi, United Arab Emirates. For the city, see Al Ain. 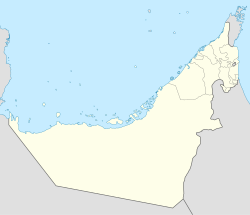 For the Eastern Region of the Emirate of Abu Dhabi, see Al-Ain Region, Abu Dhabi. For other uses, see El Ain (disambiguation). Al-Ain Oasis (Arabic: وَاحَـة الْـعَـيْـن‎, translit. Wāḥat al-‘Ayn, "Oasis of the Spring") is the largest oasis in the city of Al Ain, within the Eastern Region of the Emirate of Abu Dhabi, the United Arab Emirates. It is located in Al-Mutawa'a District in central Al-Ain, and east of Al-Jahili District. The border between Al-Ain City and the Omani town of Al Buraimi is to the northwest. Adjacent to the oasis are Al Ain National Museum to the east, and Al Ain Palace Museum to the west. To south is Al Ain Sports Club. To the southwest are Al Ain Etisalat Building and the Oasis Hospital. Al Ain Oasis is also known as Al-Jahily Falaj. It was built by Zayed the Grand. The oasis is known for its underground irrigation system (falaj or qanāt), which brings water from boreholes to water farms and palm trees. The falaj irrigation is an ancient system dating back thousands of years and is used widely in Oman, UAE, India, Iran, and other countries. ^ a b "واحة العين مجمع التاريخ وملتقى الجمال". Al-Khaleej (in Arabic). 2014-09-04. Retrieved 2016-10-12. ^ "Al Ain". The Report Abu Dhabi 2010. Oxford Business Group. 2010. p. 171. ISBN 978-1-9070-6521-7. ^ "Al Ain National Museum". VisitAbuDhabi.ae. Retrieved 2017-08-06. ^ "Museum and archaeological park for Abu Dhabi". Past Horizons. Archived from the original on 2012-03-06. Retrieved 2013-12-21. ^ Wilson, A. (2008). "Hydraulic Engineering and Water Supply". In John Peter Oleson. Handbook of Engineering and Technology in the Classical World (PDF). New York: Oxford University Press. pp. 290–293. ISBN 978-0-19-973485-6. Archived from the original (PDF) on 2017-11-07. Retrieved November 1, 2017. ^ Goldsmith, Edward. The qanats of Iran. Archived from the original on 2012-01-14. Wikimedia Commons has media related to Al-Ain Oasis.